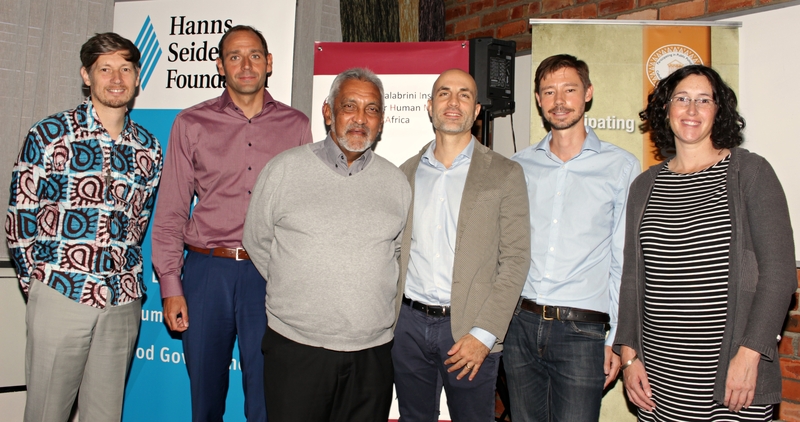 The event was addressed by the three co-authors/researchers of the report: Mr Sergio Carciotto, Associate Director at SIHMA; Dr Vanya Gastrow, Post-Doctoral Fellow at UCT; and Mr Corey Johnson, Advocacy Officer at the Scalabrini Centre in Cape Town. Mr Carciotto opened proceedings by giving an overview of the Report, and some of the research methodology employed to compile it. He stressed that every effort was made by the research team to contact the Department of Home Affairs and the Portfolio Committee on Home Affairs to form part of the research, but to no avail. Mr Carciotto continued to highlight some of the main findings of the Report (which the next two speakers elaborated on) and emphasised that the Report’s conclusion and recommendations are based on projections/assumptions of what would happen when the amendments to the Refugee Act are implemented. As an introduction, Mr Johnson, gave some background on the work of the Scalabrini Centre and how that experience has exposed him to the daily struggles of the migrant and refugee communities. He continued by talking about the development of the Refugee Act and the active role civil society played in ensuring the development and adoption of a very progressive piece of legislation that is hailed throughout the world. However, while the legislation may be progressive, the implementation has been characterised by an extremely restrictive approach to the rights of refugees and asylum seekers. Mr Johnson further stressed that while the Refugee Act entitled refugees to seek employment, it had been silent on a similar right for asylum seekers. However, this had changed with the publication of the Regulations on the Refugee Act, which were drafted with little public consultation after the adoption of the Act. The Regulations now prohibit asylum seekers from seeking employment or studying. Dr Vanya Gastrow’s input centred on the implications of the Refugee Act’s curtailment of asylum seekers to seek employment. Dr Gastrow argued that the current wording of the Act prevents asylum seekers from self-employment. The wording could also, in the context of the Department of Home Affair’s White Paper on International Migration, mean that asylum seekers may be excluded from all forms of work. The consequence of this prohibition on self-employment will have a negative impact on the livelihoods of asylum seekers which may force them to circumvent the law to avoid facing destitution. This engendering of illegality will put further strain on the state to police the employment of asylum seekers. Dr Gastrow explained that the local economy may also be impacted on by a prohibition on asylum seekers to own businesses. Not only will there be a reduction in business competition, but there will also be increased competition between locals and asylum seekers for low-skilled jobs. Refugee-owned businesses may also be pressurised to employ asylum seekers from their communities instead of South Africans. By unpacking the implications of curtailing asylum seekers’ right to seek employment, Dr Gastrow illustrated that the amendments to the Refugee Act would have few benefits for South Africa, and marked a clear political shift from an emphasis on human rights and inclusivity to exclusive national interest.